Where are we? Service Times Who are we? After 139 years of Methodist Ministry in our Chapel in West Bergholt, and after much prayer and discussion among our members, a decision was made to cease Sunday worship at the end of August. With an ageing congregation and numbers falling we have sadly decided that it is no longer reasonable to continue regular Sunday morning services. The Colchester Circuit will be marketing the site for sale from September. We will continue our activities in the hall, as part of our outreach in the village, for as long as we are able. However, we are starting a new venture a mid-week worship activity on the first Wednesday of each month. This will take place at 11.00 in our Church Hall, Chapel Lane. The first of these was on September 5th and the next will be on October 3rd, both led by our Minster, Rev Ken Chalmers. All are welcome to join us and try out this new approach. We have been accepted as a class of Mile End Methodist Church and look forward to sharing worship there. 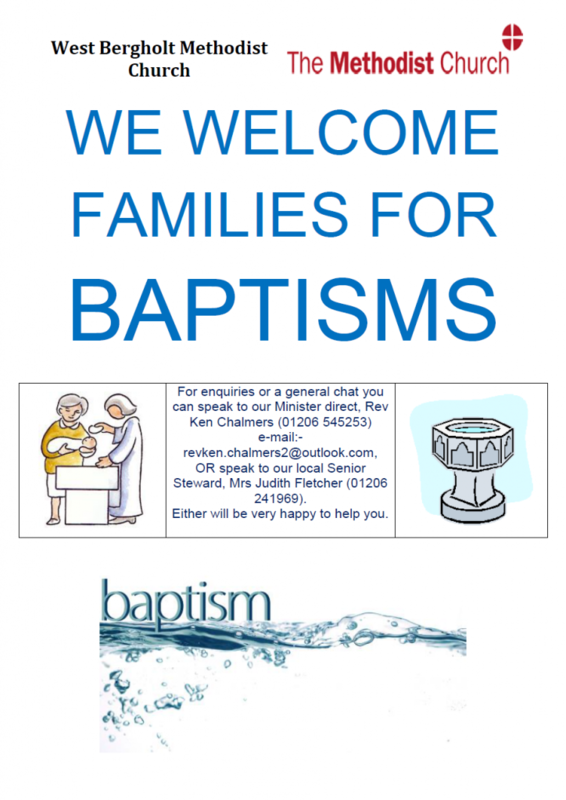 This will enable us to retain our identity as West Bergholt Methodists and keep our local fellowship together. As a worshipping community we have been attending other Methodist churches in the Circuit on a Sunday morning. This will continue from September, principally to Mile End, and transport will be available. Details from Judith (01206 241969) or Andrew (01206 242511). 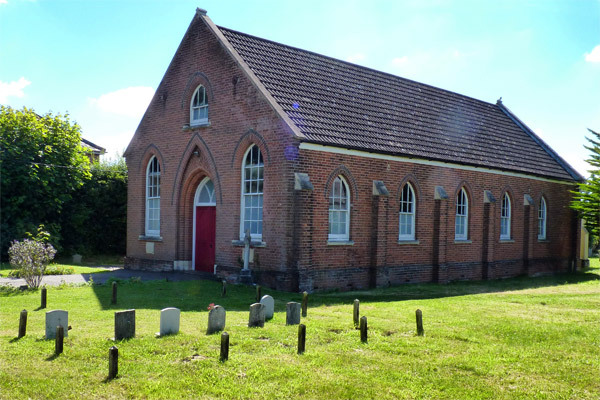 There will no longer be services in our Methodist Chapel in West Bergholt on Sunday mornings. Sunday morning services will take place at Mile End Methodist Church at 10-30am. Transport will be available, leaving the village at 10.00am. If you would like a lift please contact Judith (01206 241969) or Andrew (01206 242511). We are starting a new venture; a mid-week worship activity on the first Wednesday of each month. These will take place at 11.00am in our Church Hall, Chapel Lane led by our Minster, Rev Ken Chalmers. All are welcome to join us and try out this new approach. We are a group of Christians from different backgrounds, meeting to share in worship, learning, fellowship and service to others. We are in a growing village (population circa 3,500), popular with commuters (nearness to North Station) but distinct from Colchester, being separated by A12. The church is situated in the centre of the village. Sunday morning services are traditional in format, together with a quarterly joint ecumenical service with two local Parish Churches. The present church building was built in 1879 but there has been a Methodist presence in the village even longer. Membership is eleven with some 30/40 on the community roll. A largely elderly congregation, but the small band of worshippers has a significant profile within the community through a variety of well supported regular activities. Our Fellowship Group meets monthly on the 3rd Wednesday at 2.30pm in our Hall, Chapel Lane, CO6 3EF. There is an annual program of a variety of invited speakers and activities. All are welcome. We hold monthly Coffee Mornings in our Hall on the 2nd Wednesday of each month from 10.00 to 11.30. Coffee or tea and a biscuit 50p. There are homemade cakes, bric-a-brac and card stalls. All are welcome for a relaxing social occasion. There are Coffee & Craft mornings for young families during the school holidays. These take place on Monday mornings in our Hall, Chapel Lane, CO6 3EF, from 10.30 to 12.00. Charge of £2-50 per family. Coffee and cakes for parents and children included. Six different craft activities on a theme for the morning. Closes with Bible story linked to theme. There are Silver Sunday Afternoon Teas on occasional Sunday afternoons from 3.00 in our Hall, Chapel Lane, CO6 3EF, supported by the local Scout group. Aimed at elderly members of community, particularly those who are lonely and isolated. We have worked with local Churches, Care Network, Parish Council, Essex Community Agents , Colchester Borough Homes and Age UK to try and reach target audience but still feel there are more we could reach out to if we could make contact. Our new Bible Study Book Club meets every third Wednesday of the month at 10:30 am in our hall. All are welcome. If you would like to come to any of our services, or any other church activities, but would need a lift, please phone 01206 242511 or 241969. There will not be a service in our village this year. There will be a Good Friday Reflective Service at 10am held at St John’s Church, Great Horkesley, Elstar Lane CO6 4FE, a contemplative service focusing on the events of the crucifixion. Walk of Witness in town centre, meet at 11.45 in Essex Street to begin walk at 12.00, finishing at Lion Walk. Service at Mercury Theatre at 7.30 pm. Led by Seeking God’s Blessing for Colchester & Cantus Firmus choir. Speaker Rt Rev Roger Morris, Bishop of Colchester. We are holding another of our Coffee and Craft mornings providing fun activities for young families (children please bring a parent along). This will take place in the West Bergholt Methodist Church Hall, Chapel Lane from 10.30 – 12.00 on Monday 15th April. For further details phone Andrew (242511). Donations of cakes would be appreciated. ALL ARE WELCOME. The next Fellowship group meeting will be at 2.30pm in the Church Hall on Wednesday April 17th when the speaker will be Mrs Marjorie Culham from Guide Dogs for the Blind. April 27th/28th “Better Together” There will be a Study day on the Saturday and a United service at Castle at 11.00 am on Sunday. Further details will be made available shortly. Volunteers are needed for distribution and collection of envelopes around the village. Please contact Andrew Wilks if you can help. St Mary’s are planning to run a 3 Parishes Lent Course on Wednesday evenings at 8pm in the church hall on the following dates: 13th, 20th & 27th March, 3rd & 10th April. The theme will be the radical nature of the gospel with a special focus on the church in India and topics covered include taking action to combat human trafficking and inspiring school children to care for the environment. Tea and biscuits will be served from 8.00pm. You are warmly invited to join them. Our Methodist Church Hall is a separate building from the Church and is reached from Chapel Lane, CO6 3EF. 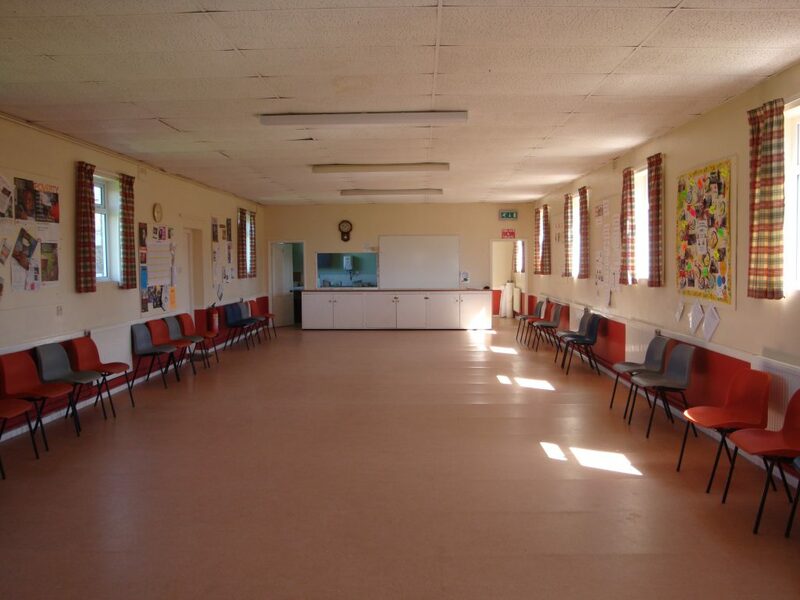 The Hall is available for hire with kitchen, disabled access and toilets and parking facilities. All enquiries please to Mr David Kay 01206 243574. Our newsletters are available below. We also have a page on the village website.